This is my third post discussing the Students For Fair Admissions lawsuit against Harvard over discrimination against Asian-American applicants. 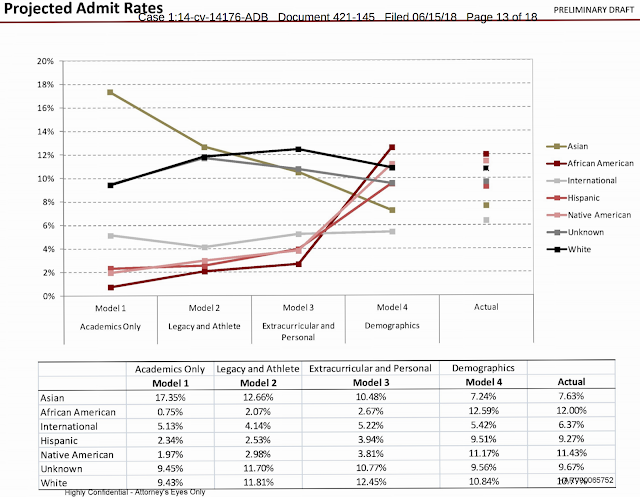 Earlier posts here and here discussed, among other things, the tendency of the Admissions Office to assign low personal ratings to A-A applicants. A-As received, on average, the lowest such ratings among all ethnic groups from the Admissions Office. In contrast, alumni interviewers (who actually met the candidates) gave A-A applicants scores comparable to white applicants, and higher than other ethnic groups. The figures below show several OIR models which try to fit the observed admit rates for various groups. The only model that comes close (Model 4) is one which assigns outright penalties to A-A applicants (using "demographic" -- i.e., explicitly racial -- factors). IIUC, this is *after* the low Personal Rating scores from the Admissions Office have already been accounted for! In the decades leading up to the data discovery forced by the SFFA lawsuit, we heard many claims that legacy / recruited athlete status, or leadership characteristics, or extracurriculars, were the reasons for A-As having such a low acceptance rate (despite their strong academic records). The OIR analysis shows that these effects, while perhaps real, are only part of the story. 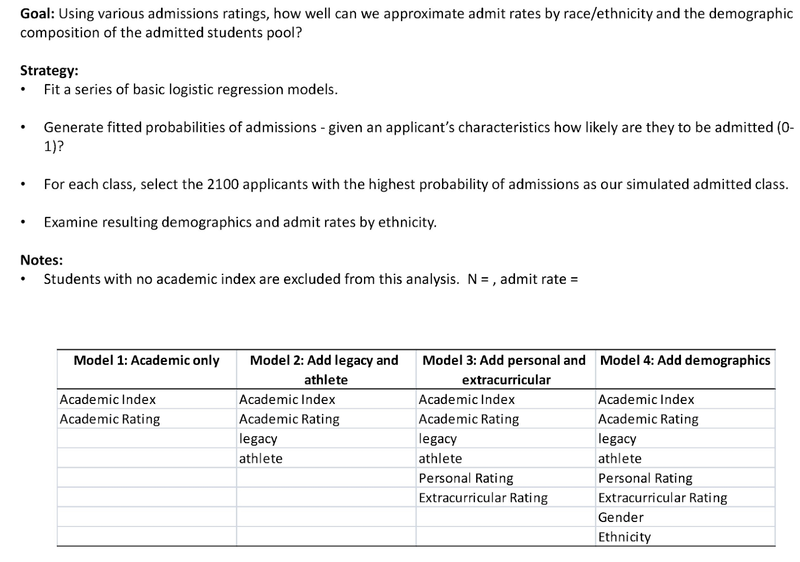 In Model 4, pure racial bias reduces the A-A percentage of the entering class from 26% (after accounting for all the factors listed above) to the actual 18-19%! The second report included the figure below. 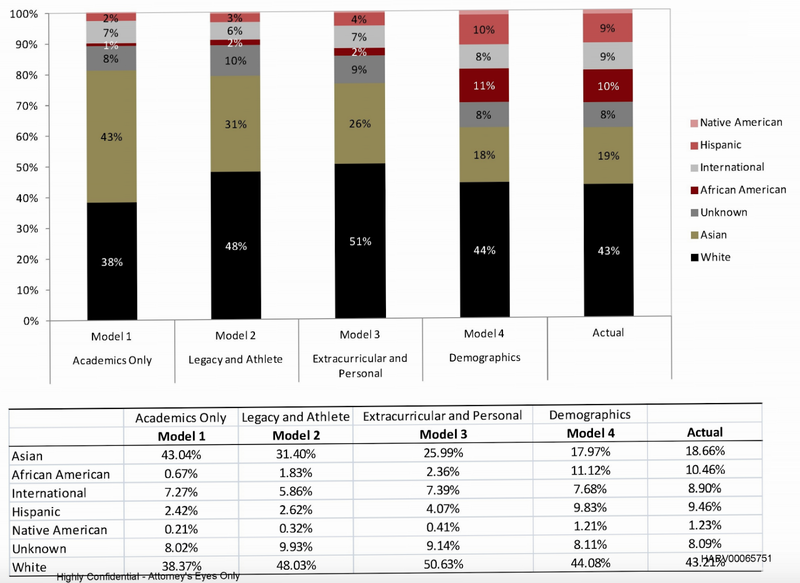 Differences are in SDs, Asian = Asian-American (International applicants are distinct category), and Legacy and Recruited Athlete candidates have been excluded for this calculation. OIR found that Asian-American admit rates were lower than white admit rates every year over a ten-year period even though, as the first of these two charts shows, white applicants materially outperformed Asian-American applicants only in the personal rating. Indeed, OIR found that the white applicants were admitted at a higher rate than their Asian-American counterparts at every level of academic-index level. But it is even worse than that. 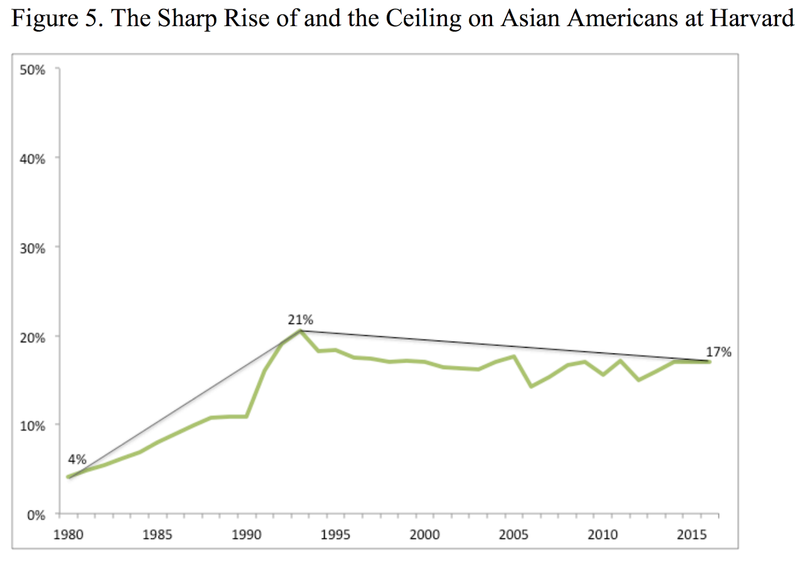 As the second chart shows, being Asian American actually decreases the chances of admissions. 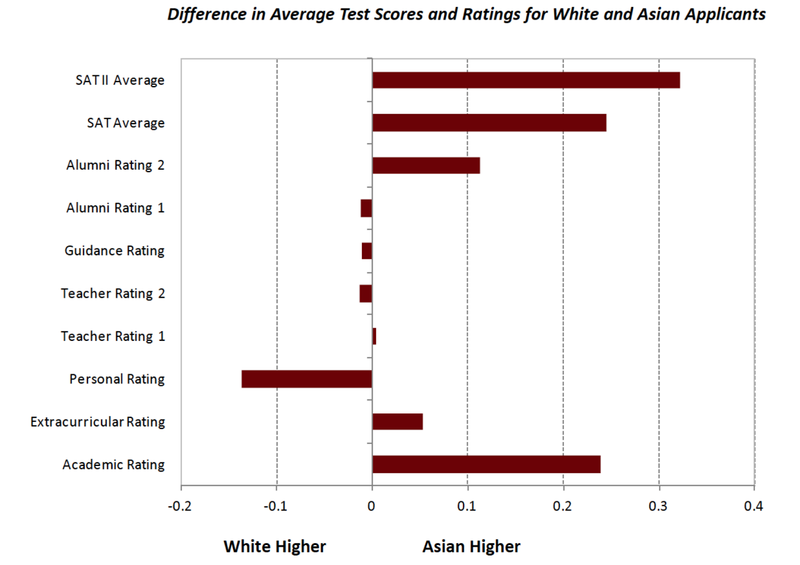 Like Professor Arcidiacono, OIR found that preferences for African American and Hispanic applicants could not explain the disproportionately negative effect Harvard’s admission system has on Asian Americans. On David Card's obfuscatory analysis: the claim is that within the pool of "unhooked" applicants (excluding recruited athletes, legacies, children of major donors, etc. 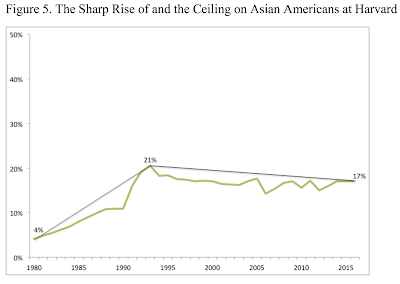 ), Asian-Americans are discriminated against. Card's analysis obscures this point. The task here is to determine whether “similarly situated” applicants have been treated differently on the basis of race; “apples should be compared to apples.” SBT Holdings, LLC v. Town of Westminster, 547 F.3d 28, 34 (1st Cir. 2008). Because certain applicants are in a special category, it is important to analyze the effect of race without them included. Excluding them allows for the effect of race to be tested on the bulk of the applicant pool (more than 95% of applicants and more than two-thirds of admitted students) that do not fall into one of these categories, i.e., the similarly situated applicants. For special-category applicants, race either does not play a meaningful role in their chances of admission or the discrimination is offset by the “significant advantage” they receive. Either way, they are not apples. [M]y feelings towards Harvard have been slowly changing over the years. I’ve been interviewing for the college for almost 10 years now, and in those ten years, none of the Asian American students I’ve interviewed has been accepted (or even wait-listed). I’m 0 for about 20. This is the case despite the fact that their resumes are unbelievable and often superior to those of the non-Asian students I’ve interviewed who are admitted. I’ve also attended interviewer meetings where Asian candidates are summarily dismissed as “typical” or “not doing anything anyone else isn’t doing” while white or other minority candidates with similar resumes are lauded. Harvard and Students For Fair Admissions (SFFA), which is suing Harvard over discrimination against Asian-American applicants, have released a large set of documents related to the case, including statistical analysis of records of more than 160,000 applicants who applied for admission over six cycles from 2000 to 2015. Documents here and here. NYTimes coverage. The following point does not require any sophisticated modeling (with inherent assumptions) or statistical expertise to understand. Yet Harvard’s admissions officials assign Asian Americans the lowest score of any racial group on the personal rating—a “subjective” assessment of such traits as whether the student has a “positive personality” and “others like to be around him or her,” has “character traits” such as “likability ... helpfulness, courage, [and] kindness,” is an “attractive person to be with,” is “widely respected,” is a “good person,” and has good “human qualities.” Importantly, Harvard tracks two different personal ratings: one assigned by the Admissions Office and another by alumni interviewers. When it comes to the score assigned by the Admissions Office, Asian-American applicants are assigned the lowest scores of any racial group. ... By contrast, alumni interviewers (who actually meet the applicants) rate Asian Americans, on average, at the top with respect to personal ratings—comparable to white applicants and higher than African-American and Hispanic applicants. For the statistically sophisticated, see Duke Professor Arcidiacono's rebuttal to David Card's analysis for Harvard. If these entirely factual and easily verified characterizations of Card's modeling (see below) are correct, the work is laughable. Professor Card’s models are distorted by his inclusion of applicants for whom there is no reason to believe race plays any role. Professor Card, however, includes all of these applicants in his model, taking the remarkable position that there is no penalty against Asian-American applicants unless Harvard imposes a penalty on every Asian-American applicant. But this is an untenable position. I do not assert that Harvard uses race to penalize Asian-American applicants who are recruited athletes, children of donors (or others identified on the Dean’s List), legacies, or other preferred categories. By including these special recruiting categories in his models, Professor Card obscures the extent to which race is affecting admissions decisions for all other applicants. Professor Card removes interaction terms, which has the effect of understating the penalty Harvard imposes on Asian-American applicants. As Professor Card notes, his model differs from mine in that he removes the interaction terms. An interaction term allows the effects of a particular factor to vary with another distinct factor. In the context of racial discrimination, interaction terms are especially helpful (and often necessary) in revealing where certain factors operate differently for subgroups within a particular racial or ethnic group. For example, if a law firm singled out African-American women for discriminatory treatment but treated African-American males and other women fairly, a regression model would probably not pick up the discrimination unless it included an interaction between African-American and female. Professor Card rightly recognizes that interaction terms should be included in a model when there is evidence that racial preferences operate differently for particular groups of applicants; yet he nonetheless removes interaction terms for variables that satisfy this condition. The most egregious instance of this is Professor Card’s decision not to interact race with disadvantaged status—even though the data clearly indicate that Harvard treats disadvantaged students differently by race. Professor Card’s report changes none of my conclusions; to the contrary, given how easy it is to alter the results of his models and that my own models report the same results even incorporating a number of his controls, my opinions in this case have only been strengthened: Harvard penalizes Asian-American applicants; Harvard imposes heavy racial preferences in favor of Hispanic and African-American applicants; and Harvard has been manipulating its admission of single-race African-American applicants to ensure their admission rate approximates or exceeds the overall admission rate. Professor Card has demonstrated that it is possible to mask the true effects of race in Harvard’s admission process by changing the scope of the analysis in incorrect ways and choosing inappropriate combinations of control variables. But Professor Card cannot reach these results by applying accepted statistical methods and treating the data fairly. When I visited IAS earlier in the year, Witten was sorting out Lieb's (nontrivial) proof of strong subadditivity. See also Big Ed. These are notes on some entanglement properties of quantum field theory, aiming to make accessible a variety of ideas that are known in the literature. The main goal is to explain how to deal with entanglement when – as in quantum field theory – it is a property of the algebra of observables and not just of the states. For true Salter fans, a new (2017; he passed in 2015) collection of previously uncollected nonfiction: Don't Save Anything: Uncollected Essays, Articles, and Profiles. I especially liked the essay Younger Women, Older Men, originally published in Esquire in 1992. From A Sport and a Pastime. He describes it casually, without stooping to explain, but the authority of the act overwhelms me. If I had been an underclassman he would have become my hero, the rebel who, if I had only had the courage, I might have also become. ... Now, looking at him, I am convinced of all I missed. I am envious. Somehow his life seems more truthful than mine, stronger, even able to draw mine to it like the pull of a dark star. He quit. It was too easy for him, his sister told me, and so he refused it. He had always been extraordinary in math. He had a scholarship. He knew he was exceptional. Once he took the anthropology final when he hadn’t taken the course. He wrote that at the top of the page. His paper was so brilliant the professor fell in love with him. Dean was disappointed, of course. It only proved how ridiculous everything was. ... He lived with various friends in New York and began to develop a style. ... in the end he quit altogether. Then he began educating himself. She stoops with the match, inserts it, and the heater softly explodes. A blue flame rushes across the jets, then burns with a steady sound. There’s no other light in the room but this, which reflects from the floor. She stands up again. She drops the burnt match on the table and begins to arrange clothing on the grill of the heater, pajamas, spreading them out so they can be warmed. Dean helps her a bit. The silk, if it’s that, is quite cold. And there, back from the Vox opposite the Citroen garage, its glass doors now closed, they stand in the roaring dark. In a fond, almost brotherly gesture, he puts his arms around her. They hardly know one another. She accepts it without a word, without a movement, and they wait in a pure silence, the faint sweetness of gas in the air. After a while she turns the pajamas over. Her back is towards him. In a single move she pulls off her sweater and then, reaching behind herself in that elbow-awkward way, unfastens her brassiere. Slowly he turns her around. 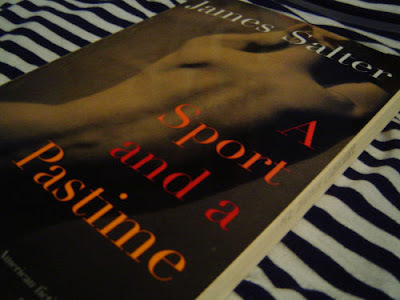 From a message to a friend, who knew Salter, and asked me to articulate what I most admire about his work. About 5 years ago I became friends with the writer Richard Ford, who offered to introduce me to his friend Salter. I was less enthusiastic to meet him than I would have been when he was younger. I did not go out of my way, and we never met. Since he lived in Aspen, and I was often there in the summers at the Physics institute, I have sometimes imagined that we crossed paths without knowing it. I admire, of course, his prose style. Sentence for sentence, he is the master. But perhaps even more I admire his view of the world -- of courage, honor, daring to attempt the impossible, men and women, what is important in life. Great profile of Geoff Hinton, Yoshua Bengio, etc., but covers many other topics. Note to readers: I'll be at the 35th International Conference on Machine Learning (ICML 2018) in Stockholm, Sweden (July 10-15, 2018), giving a talk at the Reproducibility in ML Workshop. Let me know if you want to meet up!